First of all, I honestly think that a bassist has not yet experienced the wholeness of the instrument itself without playing his or her bass through an Envelope Filter at least once. 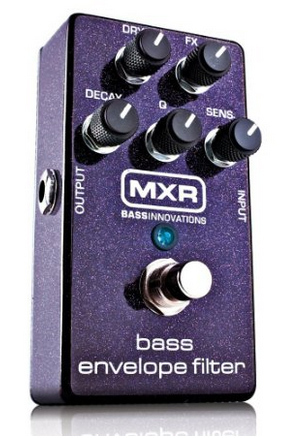 MXR are known to make top notch effects and the Bass Envelope Filter is no exception. I feel that pedals in general are there to give the player that little extra push in achieving the sound, tone and colour they want and personally, I like using the pedals I have in a subtle way and not overwhelm the signal with an over saturated sound of any given effect I use (currently my pedalboard is holding 14 pedals). One of the features that I love about the MXR Bass Envelope Filter is the sensitivity button that allows me to control the amount of “envelope filtration” by how hard I pluck the strings, this allows me a great deal of control over how much effect I want the pedal to process and is useful in situations where I combine the Envelope Filter with another effect and don’t always want a full signal saturation. Overall, I give this pedal two thumbs up and stress that it is a must for any bassist! !